PNH is an ultra-rare blood disorder. We're here to support those affected by it. 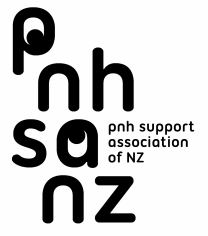 The PNH Support Association of New Zealand was established to support New Zealanders living with Paroxysmal Nocturnal Haemoglobinuria (PNH). We provide a network for patients to share experiences and knowledge. While we can't promise to make the disease burden any lighter, we hope to empower patients and families to manage the PNH condition as effectively and positively as is possible. Please have a look around and don't hesitate to get in touch if you want to know more, or would like to connect with the PNH community in New Zealand. PNH patients have been dealt a cruel blow with PHARMAC's recent decision to decline funding for eculizumab. And while there is more work to be done, it is appropriate at this time to thank all those that have supported us in our efforts to date. Finally, thank you to all those that made a submission to PHARMAC on their "proposal to decline funding for eculizumab" consultation. 296 (98%) submissions directly opposed PHARMAC's proposal. This is an overwhelming response and to give a sense of scale, 123 submissions were made to the consultation committee on the (then) proposed GCSB Legislation Amendment Bill. We are now working with the NZ Organisation for Rare Disorders (NZORD) to continue our fight for improved access to Orphan treatments in New Zealand. PNH patients are not alone in this project of social justice - namely equitable recognition of patients' right to health and right to life. Again, thank you for supporting us and in so doing, providing us with the resolve to carry on. It with sadness that we inform patients, supporters and family that eculizumab has been declined for funding in NZ. Please visit this section to learn more.